Til Birnstiel studies the mode of formation of planets from miniscule dust grains. His own professional evolution has just entered a new phase, with a Starting Grant from the European Research Council – and a Physics professorship at LMU. Experts rate the observations as sensational: They depict at unprecedented resolution the birthplace of a solar system, a nursery for planets. The synthesized image of starlight scattered off tiny dust particles, color-coded according to temperature, features a reddish-orange disk that is characterized by a series of concentric dark and bright rings. At first sight, it is reminiscent of an acrylic painting -- but that is, of course, an “artist’s impression” of the dusty disk around the young star TW Hydrae. For physicists like Til Birnstiel, the data will inspire further observations, new theories and new insights that will help resolve the many riddles of planet formation. The image is based on observations made with the Atacama Large Millimeter Array (ALMA), a set of 66 antennas in the desert of Northern Chile that has a maximum resolving power equivalent to that of a radiotelescope with a diameter of 14 km. Astrophysicist Til Birnstiel studies the dynamics of protoplanetary disks like the one imaged by ALMA in the hope of understanding how planets form within a flat disk of gas and dust around a young star. Over the course of millions of years, protoplanets grow in size from agglomerations of tiny dust grains in the millimeter-to-centimeter range to bodies with diameters of thousands of kilometers. Current evidence suggests that there are myriads of these planetary nurseries in the Universe, but none of them is closer to the Earth than the one that encircles the star TW Hydrae. Earlier observations with instruments less powerful than ALMA depicted the disk as smooth, since the resolution attainable was too low to reveal any substructure within it. However, the data collected by ALMA clearly reveal the presence of bright zones and ring-shaped gaps. Til Birnstiel (34) was one of the authors of the report that described ALMA’s observations of the TW Hydrae system which appeared last year. He had spent the previous 3 years as a postdoctoral theorist in the Observational Astronomy Group at the Harvard-Smithsonian Center for Astrophysics (CfA) in Cambridge, Massachusetts. He is now a professor at the LMU Observatory, having obtained one of the coveted and highly endowed Starting Grants awarded to especially promising young researchers by the European Research Council (ERC). He moved to Munich only a few weeks ago, and as yet he is on his own and in the process of building an new group. The office he now occupies will soon be refurbished, but is currently equipped with a desk, several computers -- and an espresso machine. The scientists at the CfA intend to make high-resolution observations of a further two dozen or so protoplanetary disks – a huge project. Birnstiel will be involved in this campaign, as he remains affiliated with the CfA as a as a Research Associate. The planned observations should make it possible to resolve substructures within the disks, he says. At all events, the notion that such disks are simply clouds of gas and dust has been laid to rest by the ALMA data for TW Hydrae. But what exactly is the significance of the gaps that the images disclose? One attractive explanation is that evolving protoplanetary bodies have already cleared much of the dust from these areas as they orbit the star. Til Birnstiel has an alternative theory: The visible or infrared light that a telescope “sees” as a cloud actually results from the scattering of radiation by enormous numbers of tiny particles – the same effect that reveals the nature of a cloud of brightly lit cigarette smoke, he explains. However, when cosmic dust particles have grown beyond sizes comparable to those of the particles in smoke this scattering effect is drastically diminished – which would also explain why these gaps look darker than the surrounding regions of the disk. “So the fact that these regions are dark does not necessarily mean that there is nothing there,” he says. Visible gaps may also be attributable to the dynamic motions of materials within the cloud, as turbulence could cause some regions to become less dense than others. “There are usual several possible explanations for a given observation,” Birnstiel says. “And it takes a lot of detective work to come up with the most plausible interpretation.” As if to prove his point, his new colleague at the LMU Observatory Professor Barbara Ercolano recently proposed a third model for the formation of gaps. Protoplanetary disks are thought to have lifetimes of about 10 million years, which is around the age estimated for the TW Hydrae system. According to Ercolano’s calculations, the particularly prominent inner gap in the disk around TW Hydrae signals that dust accretion will soon cease. In this model, the protoplanetary disk has already passed its zenith and will disperse completely within the next 10 million years or so. Thanks to a process known as photoevaporation, the disk around TW Hydrae is already being depleted of dust and gas, she says. The intense X-radiation emitted by the star heats the gas, which is essentially blown out of the disk, dragging the dust particles with it – and thus producing a gap. All of these potential explanations emerge from comparisons between theoretical models and observational data, but they are only some of the pieces in the larger puzzle presented by the process of planet formation, which researchers like Birnstiel are trying to put together. Protoplanetary disks are largely composed of gas. Indeed, only 1% of the matter in the disk consists of dust grains around 1 micrometer in diameter – silicates, carbon compounds, but also more complex molecules. As this mixture of gas and dust rotates around a central star, gravitation and angular momentum together force the initially spherical cloud into the form of a disk. Random collisions between particles take place within the disk that result in the progressive agglomeration of dust grains, which are held together by surface interactions. “Just as balls of fluff accumulate in the corners of rooms that haven’t been cleaned for a while,” Birnstiel says. However, when the dust grains have reached diameters on the order of 1 millimeter, collisions between them are more likely to break them up than help them to grow. In addition, larger grains are gravitationally drawn inward toward the large mass of the central star. How then can the tiny grains continue to grow? The answer is that there are apparently regions in protoplanetary disks that act as dust traps, in which further growth is favored. Until a few years ago, the notion of dust traps was a purely theoretical concept, Birnstiel says. But then astrophysicists discovered asymmetric accumulations of millimeter-sized particles in a protoplanetary disk, while smaller particles were distributed concentrically around the star. These dust traps are characterized by higher gas pressures which force particles closer together, thus facilitating the formation of ever denser and larger accumulations of matter. Under such conditions – and over long periods of time – these dust traps can give rise to bodies the size of asteroids, with diameters of 100 kilometers and more. Birnstiel now wants to incorporate this growth mechanism into a comprehensive model that accounts for all available observations and allows one to make predictions that can be tested in further observational campaigns. Here again, we see role of the interplay between modeling and observation. Moreover, simulations of such complex processes may occupy supercomputers for weeks at a time. In fact, Birnstiel’s ERC project is even more ambitious: It entails not only simulations of the dynamics and evolution of the dust component, but also the inclusion of data relating to the chemical composition of the disk – data that ALMA can supply. For ALMA’s array of antennas not only sees the dust, but also traces of gas molecules, he says. “So one can get some idea of what the other 99% of the disk is doing.” And with these data, it should be possible, for example, to work out the conditions under which Earth-like planets that possess surface water can form or how planets acquire atmospheres with specific compositions. 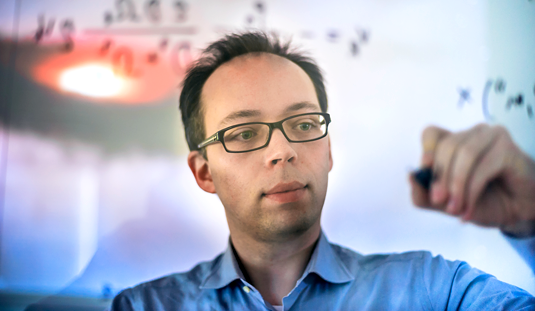 Birnstiel first focussed on theoretical astrophysics while working on his doctoral thesis, partly because he was intrigued by the possibilities offered by computer-based physics. He studied in Würzburg and Albany (New York State) and did his PhD in Heidelberg. In fact, in the summer of 2011, he worked as a postdoc in Barbara Ercolano’s group for 18 months. Then he received the offer from the CfA. “It was simply an offer I could not refuse.” After 3 years at the CfA he returned to the Max Planck Institute for Astronomy in Heidelberg, where he had done his PhD and a stint as a postdoc. He wrote the proposal that won him an ERC Starting Grant at the Institute, but moved to LMU to carry out the project when the grant came through.